Biblical Allusions 1. Big Nurse: "Stay back! Patients aren't allowed to enter the- Oh, stay back,I'm a Catholic!" (p.76) In this quote Nurse Rachet. 2 Biblical Allusions 1. Big Nurse: "Stay back! Patients aren't allowed to enter the- Oh, stay back,I'm a Catholic!" 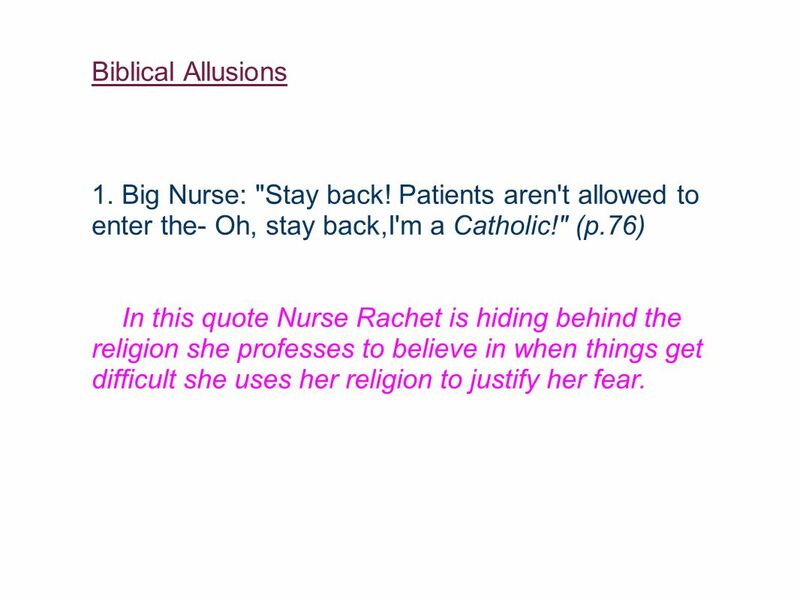 (p.76) In this quote Nurse Rachet is hiding behind the religion she professes to believe in when things get difficult she uses her religion to justify her fear. 3 2. "they lifted him off the table for the last time, in the same shape, arms out, palms cupped, with the same horror on his face. 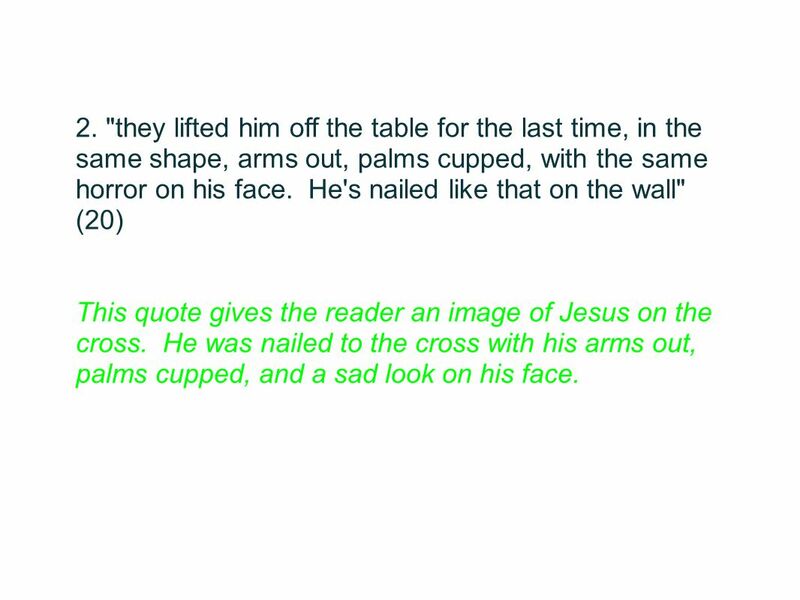 He's nailed like that on the wall" (20) This quote gives the reader an image of Jesus on the cross. He was nailed to the cross with his arms out, palms cupped, and a sad look on his face. 4 3. "And when he finishes shaking hands with the last Acute he comes right over to the Chronics, like we aren't no different." 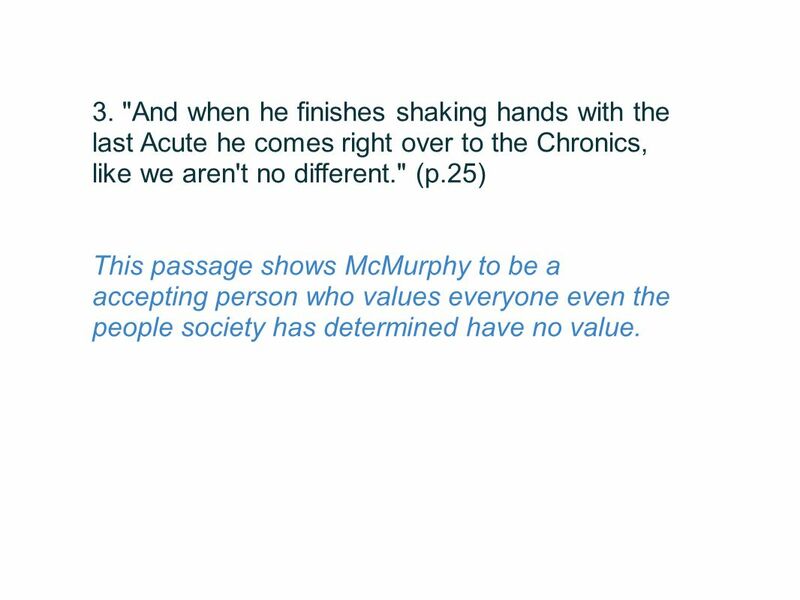 (p.25) This passage shows McMurphy to be a accepting person who values everyone even the people society has determined have no value. 5 4. 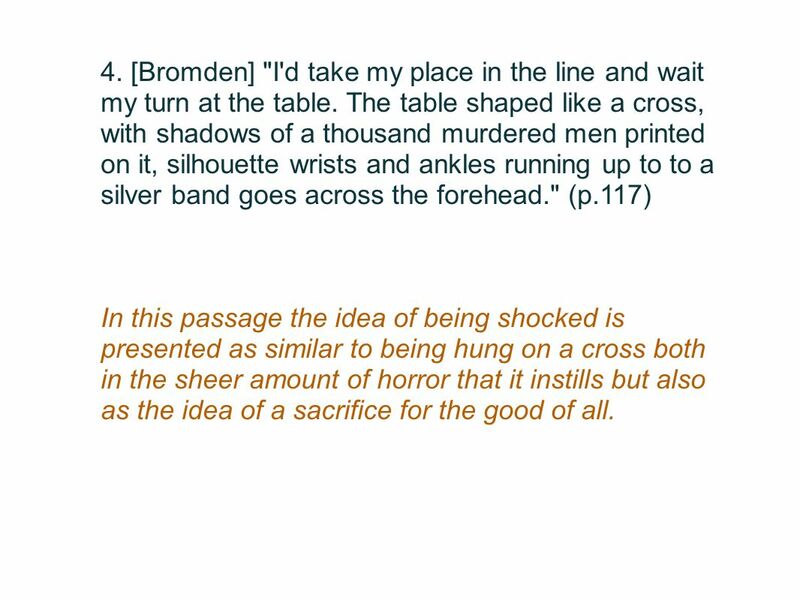 [Bromden] "I'd take my place in the line and wait my turn at the table. The table shaped like a cross, with shadows of a thousand murdered men printed on it, silhouette wrists and ankles running up to to a silver band goes across the forehead." (p.117) In this passage the idea of being shocked is presented as similar to being hung on a cross both in the sheer amount of horror that it instills but also as the idea of a sacrifice for the good of all. 5. 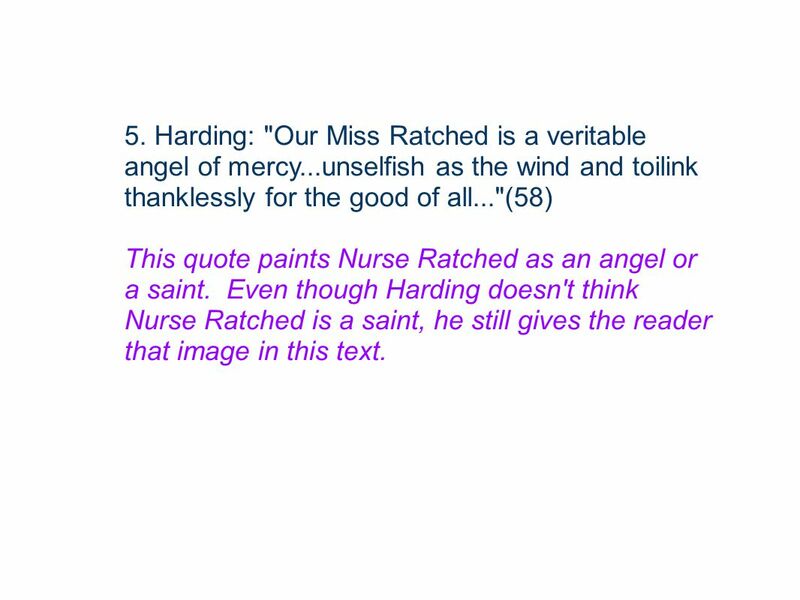 Harding: "Our Miss Ratched is a veritable angel of mercy...unselfish as the wind and toilink thanklessly for the good of all..."(58) This quote paints Nurse Ratched as an angel or a saint. Even though Harding doesn't think Nurse Ratched is a saint, he still gives the reader that image in this text. 8 Chief Bromden 1. His name was given to him because of his Native American heritage, but is also mocking him because at this point in the book he is clearly not a "chief" or a leader. 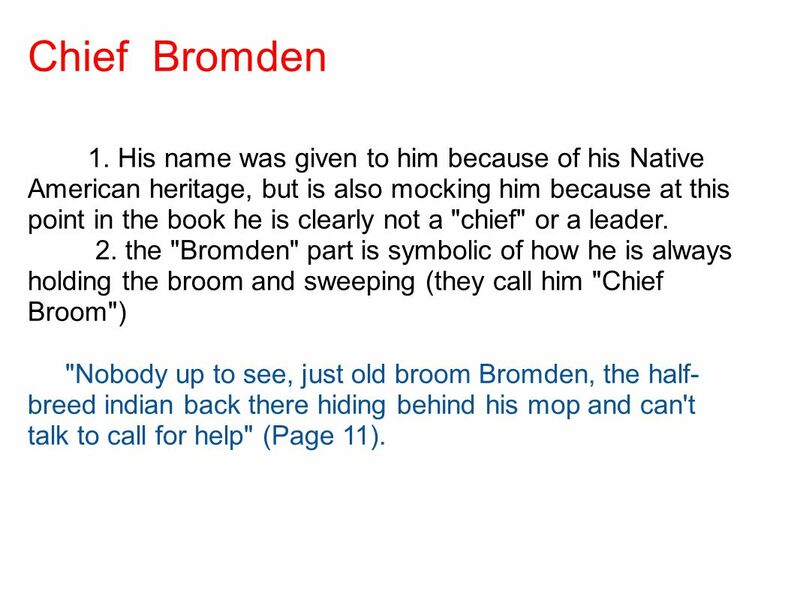 2. the "Bromden" part is symbolic of how he is always holding the broom and sweeping (they call him "Chief Broom") "Nobody up to see, just old broom Bromden, the half-breed indian back there hiding behind his mop and can't talk to call for help" (Page 11). 9 Nurse Ratched "Big Nurse"
1. Ratched sounds like wretched, and despite her pleasant appearance, all of the patients and her coworkers know how evil, controlling, and "wretched" she is. "...that nurse ain't some kinda monster chicken, buddy, what she is is a ball-cutter. I've seen a thousand of 'em, old and young, men and women... people who try to make you weak so they can get you to toe the line, to follow their rules, to live like they want you to." (Page 57) 2. Ratched is mechanical and dehumanizing. The one humanizing feature about her is her large breasts, which she tries to hide at all costs. 3. Also, Big Nurse sounds like Big Brother, symbolic of her dehumanization and oppressiveness. Everyone in the ward who is insane is clearly separated by the sane by their names. McMurphy and all of the "black boys" names like Washington, Sam, and Williams, which are regular sounding names because they are normal. 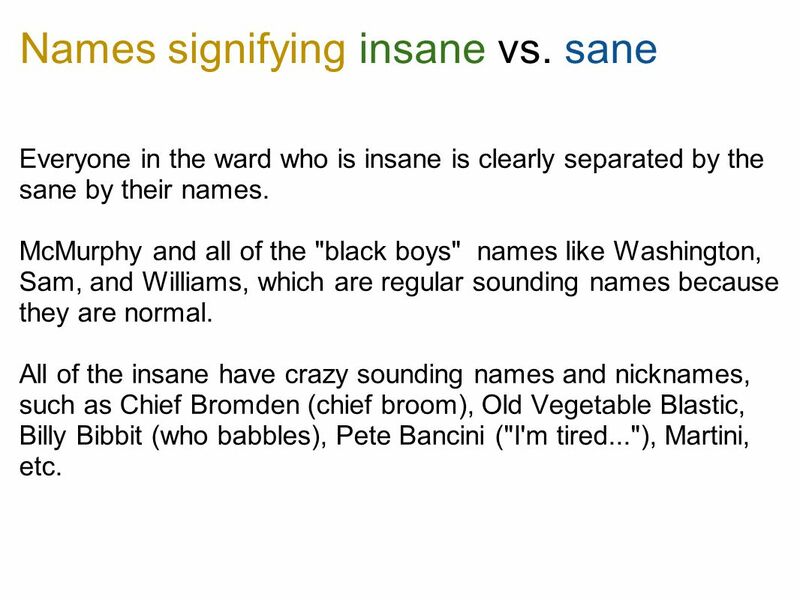 All of the insane have crazy sounding names and nicknames, such as Chief Bromden (chief broom), Old Vegetable Blastic, Billy Bibbit (who babbles), Pete Bancini ("I'm tired..."), Martini, etc. Download ppt "Biblical Allusions 1. Big Nurse: "Stay back! Patients aren't allowed to enter the- Oh, stay back,I'm a Catholic!" (p.76) In this quote Nurse Rachet." THEMES.  The final assessment for One Flew Over the Cuckoo’s Nest is a group presentation.  Each group will choose a theme from the novel.  Each group. Aim: How do we explain the relationship between caretakers and patients in One Flew Over the Cuckoo’s Nest? Do Now: How should the mentally disturbed be. Aim: How is McMurphy’s loyalty to the ward tested? Do Now: What does the following mean? “You cannot make a revolution with silk gloves.” – Joseph Stalin. Learning Objective: To understand how to use paragraphs correctly in my work. Aim: How does Nurse Ratched manipulate the patients in ward? Do Now: What are the different ways in which people can gain power over each other? Character Sketches of McMurphy The focus on how Chief as well as society views McMurphy. Thoughts and images inside the mind of a “dumb and deaf” narrator brought to focus through students’ sketches and analysis. Aim: How does McMurphy begin to emerge as a Christ-figure in Part III of One Flew Over the Cuckoo’s Nest? Do Now: What does the following mean? “Many men. 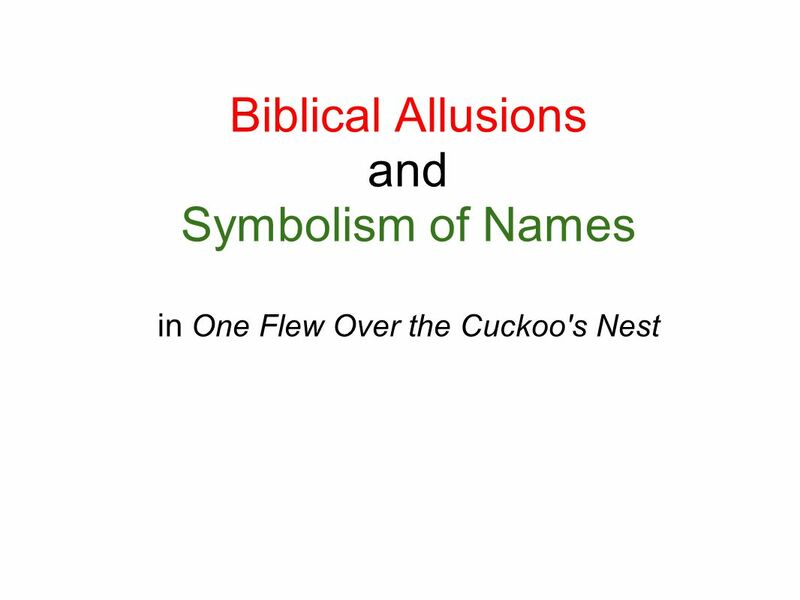 Allusions In One Flew Over the Cuckoo’s Nest Examining how pop culture references impact and strengthen the novel. 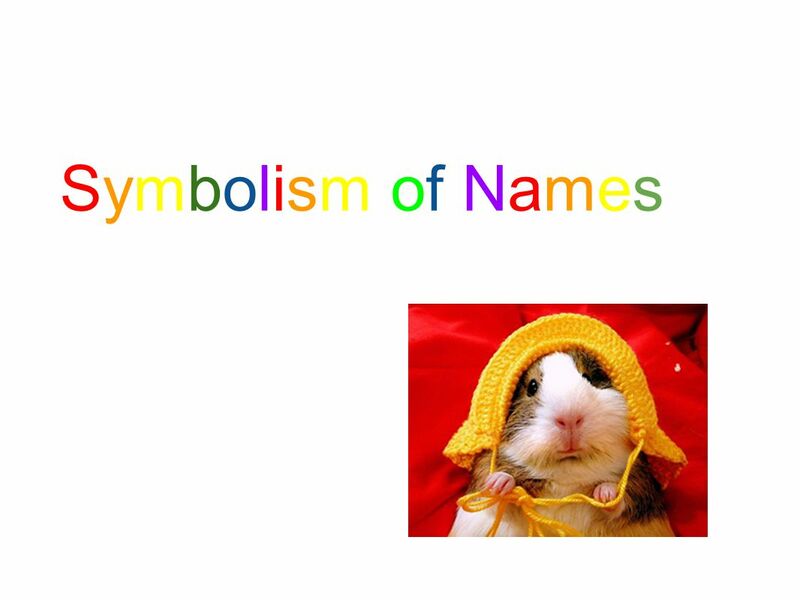 Note: Students in our class are using. One Flew Over the Cuckoo’s Nest By Ken Kesey. … one flew east, one flew west, One flew over the cuckoo’s nest. - Children’s folk rhyme. Jump to first page One Flew Over the Cuckoo’s Nest A Down and Dirty Summation. One Flew Over the Cuckoo’s Nest Characters. Chief Bromden  Narrator  Pretends to be mute and deaf seemingly to protect from pain  (note: Some critics. Discussion Director O Writer’s Notebook ( ed Night Before) O Discussion Points: O What’s going on? O Bromden – History? Perspective? O The Ward – Schedule. Bellwork: (journals) Part I: who said it, to whom speaking, why significant? Part II: Do you have any friends that you might label as crazy? Why? Ficticious.